So after Clara's epic first few toddling steps she happily reverted to cruising, standing, and crawling. It seemed that she would ony brave freestanding steps for Gerald until he let me in on a little secret. Clara totally toddles towards his glowing smartphone. She is entranced by the lure of the glowing button on the touchscreen she has figured out how to swipe and unlock. She giggles and walks faster when Gerald turns on the camera and she can see herself walking towards herself. The other day I was sitting at my desk drinking out of a one liter bottle of seltzer. Clara happens to love drinking out of anything that's not a baby bottle. She was hooked. I rolled about five feet away and held out the bottle. Clara exclaimed: "Ticka gooey ticka AGOOOO!" and miraculously took ten steps towards me, all by herself, to get a swig out of that bottle. So two days ago, Clara decided it was time to try walking. She toddled towards her Daddy in the hallway of our apartment while I was upstairs visiting the newborn twins of our neighbors. I guess she didn't want a big audience. But she happily gave an encore of her solo toddling when I came back downstairs. She was exactly one year and one week old. As if that wasn't enough, the following day Clara decided to take her first word out for a spin. She crawled into the bathroom, pulled up on this little storage unit we have, picked up the bubbles that I have been entertaining her with at bath time, handed them to me and said: "Bubble." This time it was Gerald who wasn't home for the amazing event. Clearly, Clara is relishing divvying out her milestones to her amazed parents. The old saying: "They grow up so fast." has taken on new meaning this week. Here's a picture of Clara playing with some vintage toys. The TOMY typewriter was mine when I was little. The typewriter actually advances and dings when you reach the end. When you push it to return it advances to the next letter. 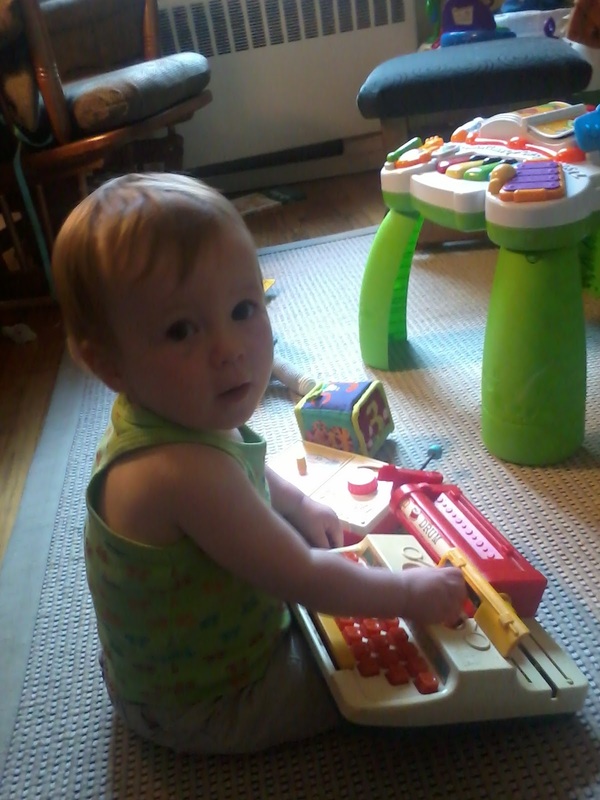 Clara is learning valuable skills with a manual typewriter that will come in handy when the technology grid shuts down in some future apocalypse where our Ipads no longer work. Note the wind-up Fisher Price Clock radio in the background. Sure, that toy only plays Hickory Dickory Dock but Clara will know how to hand-crank her portable radio when the zombies come. After a wonderful party with family, Clara ended her birthday with a much needed bath. Celebratory bubbles were in order, much to Clara's delight. Tomorrow Clara Jane will be one year old. It's been an amazing year of firsts. Clara is constantly doing new things for the first time. Smiling, clapping, waving, sitting up, crawling, cruising, laughing, being ticklish, babbling, playing, and most recently, standing on her own. As the year went on Gerald and I got more sleep, and so did Clara. Watching her grow over the past year from a newborn into a sturdy little kid has been incredible. I now understand what parents mean when they say: "there is no greater gift than your children." There are many milestones for a baby, and for her parents. One year. That's pretty big. I have fond memories of digging for worms in Riverside Park with my sister Becky. We dug to find the worms and look at them wriggle. I loved watching how they dug themselves back into the dirt. I did not, as in many a childhood memoir, revel in cutting them up to see how many parts could survive. I just loved to dig in the soil, discover them, and set them free. My mother, probably knowing how much I liked to do this, put some worms in a large potted rubber plant she had in the house. That way, Becky and I could dig for worms in the comfort of our own home. The building I live in in Washington Heights has lovely front gardens. I have noticed recently, that when it rains the earthworms rise up out of the soil and strand themselves on the cement walkway. I don't know why they do this but I can't stand to see them struggle and eventually die away from the moist soil. So, I rescue them. I pick them up and put them back in the garden where they belong. Today when I was coming home from a Long adventure in the park with Clara I saw two lively worms in the path looking for a way home. I scooped up the first and deposited him in the dirt. Then I paused. What would Clara think? Before returning the second worm to the garden, I scooped him up and showed him to Clara. She was intrigued by this tiny, wriggling being. Finally, someone smaller than her. She reached out a tentative finger and touched him with a gentle 'hello.' I explained to her what I was doing and returned the little guy to his home. I have succeeded in creating a second generation of worm excavator and protector.